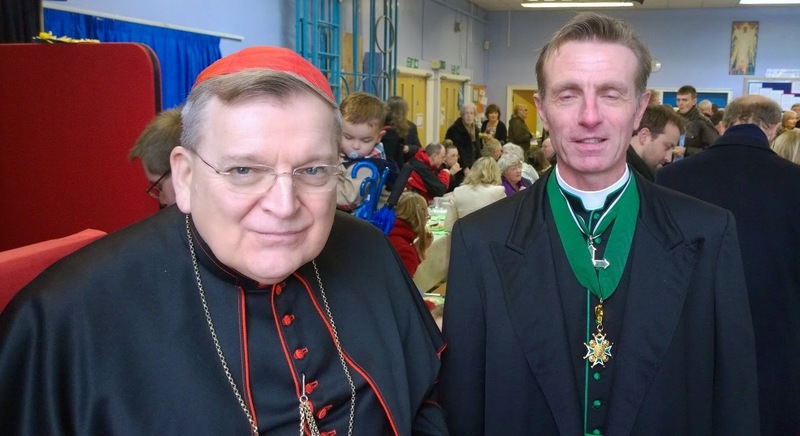 His Eminence Raymond Leo Cardinal Burke is in the UK at the moment popping up all over the country. This morning he Offered Low Mass with motets at the Shrine Church of Ss Peter and Paul & St Philomena in New Brighton, my home parish where I made my First Holy Communion. It was good to see the rather vast church pretty full of parishioners and visitors. It was great to meet Cardinal Burke. He's very serious in saying Mass but warm and charming in person. I was explaining a little to him about the work of the Order of St Lazarus in the UK and our associations with his brother Cardinals in Prague and Sri Lanka. A few more photos of the Mass at Offerimus tibi Domine.